Did you see Disney's Mulan? Did you like it? If you answered "yes" to both of those questions then you need to make sure to read this book when it's released early next year. This story of a Mongolian princess, Emmajin Beki, is a story that proves that love triangles do not need to exist in YA level books for them to be full of romance, adventure and feature a strong, willful female as the hero. Does that mean there isn't romance? No - there's a little but it's where it belongs, adding beautiful color to the background of this story instead of elbowing its way to the forefront and demanding all of the attention. Emmajin has always wanted to be a soldier and, as the granddaughter of the Great Khan Khubilai, she can expect nothing of the sort. What can she expect? Marriage to one of those soldiers - someone high ranking and to spend a lifetime in the shadows, living the quiet life of a woman in a time where women were ignored and put aside while battles waged on around them. However, Emmajin has a different plan for her life. This is a story of Emmajin's bravery, her struggle to prove herself, her sorrow as she learns the consequences for her actions and her message of hope and ultimate peace. It's filled with historical information about the time period, beautiful descriptions of the places and a glimpse of the man, Marco Polo - someone that, up until this point, I'd only been familiar with as a game. I'll be looking for more by this author - I loved the way she wrote, I loved Emmajin's voice and the story had me flipping pages with excitement, anxious to learn more of the story. 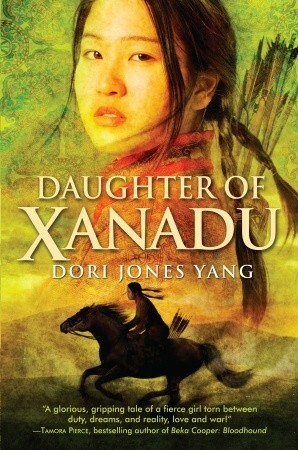 Sign into Goodreads to see if any of your friends have read Daughter of Xanadu. yay! I'm glad too. Thanks. I really liked your commentary on the proof that YA novels need not have a love triangle. It's true. This book is strong without it... and I'm so thankful for that. I am SO sick of the triangles. Littlebearries wrote: "I really liked your commentary on the proof that YA novels need not have a love triangle. It's true. This book is strong without it... and I'm so thankful for that. I am SO sick of the triangles." It's true though! I get so tired of the same old love triangles it was so refreshing to read a book that didn't rely on one to tell a story. Dori Jones wrote: "yay! I'm glad too. Thanks."